In early absentees in the race to succeed Congressman Ed Royce (R-Fullerton) in the 39th Congressional District, former Assemblywoman Young Kim (R-Fullerton) is a strong first place while lottery-winning philanthropist Gil Cisneros (D-Yorba Linda) has a small, but not insignificant, lead for second place. Shockingly, the best hope of a Republican-on-Republican contest appears to be not former Senator Bob Huff (R-Diamond Bar) nor Orange County Supervisor Shawn Nelson (R-Fullerton), but rather Businessman Phil Liberatore (R-La Habra). It appears Democratic Congressional Campaign Committee spending $2.1 million to help Cisneros and attack Huff and Nelson was effective with early absentee voters, as was $310,000 of (Democratic) House Majority PAC spending that attacked Huff and boosted Liberatore. 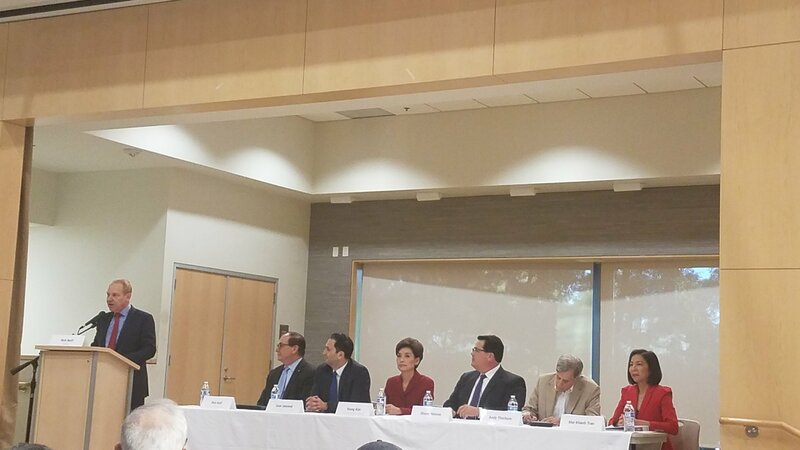 We are live from the 39th Congressional District debate sponsored by the U.S. Chamber of Commerce and the North Orange County Chamber of Commerce at the Fullerton Community Center, which has a parking lot that is ill-equipped to handle this large a crowd though there is plenty of seating inside the venue. The debate is moderated by Rick Reiff, host of Inside OC and editor-at-large of the Orange County Business Journal. The debate organizers did not indicate how many candidates were invited. Bob Huff notes his list of elected offices as Senate Republican Leader, Assemblyman, and City Council. He wants to keep a strong military, secure borders, and cut the fat from the budget. He says his record shows he has fought taxes and kept a lid on tax increases when he was a Senator. Sam Jammal notes he grew up in the district. He says people are being cut out of the definition of being American. He is the son of immigrants. He talks about living the American Dream. He speaks of working in a La Habra restaurant, the Brea Mall, and the Obama Administration. He wants a more welcoming America. Young Kim says she has lived the American Dream as an immigrant from South Korea. She worked in the private sector after college. Then she went to work for Ed Royce. She notes that she represented the district working for Royce. She notes her election broke the Democratic supermajority in the Assembly. She says she has a pro-business record and agenda. Shawn Nelson notes Fullerton is his hometown. He speaks of working with Sharon Quirk-Silva to build the building the debate is being held in. He notes that he served on the City Council and is now Supervisor. He speaks of his record with the Bridges at Kraemer Place homeless shelter and freeway improvements. He wants to reinforce American values. He proposes making education expenses fully tax deductible. Andy Thorburn says high ethics and an orderly administration are American values that are lost. He wants an inclusive society. He has been a teacher, union organizer, and international businessman. His business is a member of the US Chamber of Commerce. He was a speaker at a Chamber conference in Belgrade. He has owned a business since he was 28. He went through paying student loans and going through bankruptcy. Mai-Khanh Tran is running because of her two daughters. She was a refugee who came to a country that was warm, receiving, and caring. She fears that is not the current America. She built her own medical practice. She wants to provide health care for all. 6:54 PM: Rick Reiff asks the candidates to state their position on the tax reform bill in 90 seconds. Jammal would have opposed the bill for increasing the deficit, targeting large corporations instead of small businesses, and removing the individual health care mandate. He would have proposed a small business and middle business tax cut plan instead. Kim said it was a step in the right direction. It had child care tax credits. It is already bringing businesses back from overseas. It cut taxes for all people. She would have removed the limitation on the State and Local Tax (SALT) deduction and made the middle class tax cuts permanent. She says the plan will help provide jobs and help the middle class. Nelson says corporate tax reform was necessary to bring companies back to the U.S. from overseas. He notes the pay raises and bonuses that companies are giving out. He says it is unfortunate California has such high state and local taxes. He would have had the SALT limit indexed, so it would at least increase from inflation. Thorburn would have opposed the tax bill. He says 2/3 went to high earners and corporations with only 1/3 going to middle and low income earners. He says it increased the deficit. He says it lowered tax rates on the highest earners. He says it increased the estate tax exemption to $22 million. Tran says the bill benefited large corporations disproportionately over working families and small businesses. She says the SALT limit burdens state and local governments, threatening education, public safety, and housing programs. She says California is disproportionately affected by the mortgage interest deduction limit. Huff says the bill was good for the nation overall and improved the economy, averting a downturn. He notes big corporations employ people, and they gave raises and bonuses. Huff says he would have opposed the tax reform bill because it harmed California too much. He points to the mortgage interest deduction. He wanted a slightly higher tax on corporations. 7:04 PM: Reiff asks about tariffs, the Trans-Pacific Partnership, and NAFTA. 90 second answers. Kim is a trade proponent and fears a trade war. She notes American allies are retaliating due to the tariffs. She wants us to work with our allies, not fighting them. She says she is very pro-trade and wants to trade with other nations. Nelson says free trade requires fairness. He says the U.S. has been too willing to be a punching bag and look the other way to avoid trade wars. He blasts international economic espionage. He argues the U.S. needs to argue from a position of strength, not weakness. He says Trump is an unusual negotiator but is an effective one. He says people are already backing off on tariffs, and China will negotiate with the U.S.
Thorburn says international trade is complex. He says the administration has dealt with U.S. allies completely wrongly. He calls for resuming multilateral trade, instead of bilateral trade agreements. He notes steel tariffs harm 5 jobs for every 1 job saved. He calls for reducing trade barriers and engaging with other countries. As an international businessman, he sought amicable agreements, not threatening those he would trade with. Tran says free trade is a key part of America’s economic growth. She opposes starting a global trade war and says Trump’s tariffs would harm the U.S. She notes the stock market has fallen since the announcement of the tariffs. Huff notes many jobs have moved from California to Mexico. He says NAFTA should be revisited periodically, like all business agreements. He opposes the steel tariffs for harming more people than it helps. He agrees pushing China on intellectual property theft but would have tried diplomacy first. Jammal says he worked in the Obama Administration but TPP was negotiated in secret and was only for large corporations. He wants trade agreements to include small businesses. He says three candidates would not stand up to Trump. He says he would not support TPP. 7:15 PM: Reiff asks about Trump’s rollback of regulations and Obama executive orders. 60 second answers. Nelson says cutting regulations is the second most impactful thing Trump has done other than appointing a Supreme Court Justice. He wants low barriers to entry. He wants government to get out of the way of business to innovate and invent. Thorburn calls for neither more or less regulation but rather efficient regulation. He wants government to protect clean air, safe drugs, and safe food. He opposes Trump environmental regulation rollbacks. Tran wants to effectively provide her services, take care of her employee wages and benefits, and make a profit. She supports regulations that help that mission and opposes those that do not. She supports Thorburn’s efficient regulation philosophy. Huff applauds Trump because regulations stifle creativity, innovation, and job creation. He speaks of Silicon Valley’s innovation relatively free of regulations. He says regulations are cumbersome. Jammal calls for smart regulations, like clean air and water. He says regulations are about leadership to update old rules. He says neither party would update old regulations for fear of angering business. He says three candidates have never said no to lobbyists. Kim says California is over-regulated and heavily taxed. She served on the jobs and economic development committee in the Assembly. She worked with the Democratic chair and found that businesses felt they were overregulated. She wants a business-friendly environment. 7:24 PM: Reiff asks the candidates about what one idea they each have for infrastructure. Thorburn calls for more infrastructure spending via a segregated fund consisting of all the new tax revenue from companies returning from overseas and via savings from a Medicare for All plan. He says GDP is wasted on health care in our current system. Tran wants to repair crumbling infrastructure, which would also create jobs. She says Trump’s proposal is infeasible. She wants to cut departmental waste. She wants to close military bases recommended by the Department of Defense. She wants to do more audits of government spending. Huff says spending is a statement of priorities. Infrastructure needs to be a priority, not an excuse for tax increases. He blasts the California gas tax and VLF increase. He notes transportation money was being used for non-transportation purposes. He wants California to stop being a donor state and would bring federal dollars back to California. Jammal blasts the deterioration of Fullerton roads. He blasts three candidates for presiding over that. He says they need to fix the 57/60 interchange. He wants a modern electrical grid, electric car chargers, and cybersecurity. He would also cities what they need. He would stop buying F18 fighter jets. He would look for efficiencies in government. Kim served on the Assembly Transportation Committee. She blasts high-speed rail. She says Sacramento and Washington spend too much, including grabbing transportation dollars for pet projects, like high-speed rail. She says high-speed rail money should be redirected for roads instead. She would use public-private partnerships. Nelson notes serving as a member and Chairman of OCTA. He notes OC has the best freeway system in California. He says OCTA has spent efficiently and expanded every freeway in OC in the last eight years. He notes Orange County Water District has a AAA credit rating. He calls for government loans for infrastructure. 7:34 PM: Reiff asks if the candidates support high-speed rail: yes or no. 7:35 PM: Reiff asks for 90 second statements on immigration. Tran notes she is an immigrant and that immigrants are part of the fabric of America’s culture and economy. She wants a pathway to citizenship for DACA. She wants comprehensive immigration reform. She wants to streamline legal immigration, including family reunification. She wants to expedite visas. She wants to secure the border without a wall. Huff says there is a big distinction between “legal and undocumented immigration.” His wife is an immigrant. He calls for more secure border controls, similar to those on roads and at airports. He noted September 11, guns, drugs, and other things that resulted from porous borders. He wants a solution for DACA that does not include deportation. Jammal says undocumented immigration from Mexico is decreasing. He does not want to demonize immigrants. He blasts Nelson for the Board of Supervisors vote on the sanctuary state lawsuit. He notes that immigrants are a key part of society and the economy. He wants a path to citizenship. He believes the border crisis is a fictional crisis. Kim notes she is an immigrant. She wants a DACA fix. She does not want them to live in fear of deportation. She says DACA beneficiaries are making America great by creating jobs and bringing diversity. She wants a humane solution. She wants to revisit broken immigration laws humanely. She does not want to demonize immigrants. She wants a pathway to citizenship. Nelson says the U.S. is a nation of immigrants and a nation if laws. He says Obama provided a smaller DACA solution than Trump did. He says the U.S. should not tolerate a porous border. He says no nation should tolerate that. He noted the 1980s amnesty failed to secure the border. He wants strict border controls with more generous legal immigration. Nelson notes the Board of Supervisors action dealt only with incarcerated illegal immigrants. Thorburn says 4-5 candidates are calling for comprehensive immigration reform. He says Democrats need to take control of the House because Republicans control all branches of government. He opposes demonizing immigrants. He opposes banning Muslims. He wants a thoughtful manner with planning. He says immigrants contribute to the economy and commit fewer crimes. He says the immigration crisis is fictional. He says the border needs minor adjustments. 7:47 PM: Reiff asks if the candidates favor a DACA fix. All six raise their hands. Reiff asks if the candidates support the Board of Supervisors action on the sanctuary state lawsuit. Huff, Kim, and Nelson raise their hands. 7:48 PM: Reiff asks about the Affordable Care Act, universal health care, and single-payer health care. Huff says Obamacare was flawed with rising costs and higher deductibles. He calls for insurance portability and medical bill simplification. He opposes the individual mandate as unaffordable for young people. He calls for Health Savings Accounts. Jammal says Medicare works. He wants to preserve what works. He says the tax reform has a trillion dollar deficit and that Paul Ryan is threatening Medicare and Social Security. He believes in Medicare for All. He wants to lower the Medicare age. He wants to fix ACA with lower prescription drug prices and allow generic drugs. He wants to reduce spending for advertising drugs on TV. Kim says Obamacare is full of broken promises. He says premiums have increased. He says Medicare for All is a fringe proposal that has no pull in Sacramento or Washington. She calls for fixes but will not support an Obamacare repeal unless there is a comprehensive replacement. Nelson says Obamacare is based on everyone paying in. He says young people have to pay in to pay for the elderly for it to work. He says young adults, like his children, are overwhelmed and cannot fund the massive Baby Boomer generation. He says you cannot cut services for people who do not use them: young people do not use most health services. Thorburn says Western Europe is not bankrupt but covers all people. He says the U.S. is inefficient and overpriced. He says 18% of U.S. GDP goes to health care but we have the developed world’s lowest life expectancy and highest infant mortality while Europe spends 12%. He calls for a single-payer system. Tran notes she is a physician and businesswoman. She said premiums soared as she tried to provide health insurance to her employees until the ACA lowered these costs. She wants to improve the ACA by making sure access, affordability, and quality are protected. 7:58 PM: Reiff asks which candidates would support single-payer health care in the long run. Jamal, Thorburn, and Tran raise their hands. 7:59 PM: Reiff asks about the national debt and notes 2/3 of the budget is entitlements. He prohibits fraud and waste from being answers. Jammal says the tax reform bill added $1 trillion to the deficit. He says roads and veterans will have less funds. He says climate change is adding costs. Jammal would oppose any cuts to Medicare or Social Security. He calls for government modernization. His bureau saved $1 million by printing on both sides of the paper. He wants to repeal the tax reform bill. Kim says there is a spending problem in Sacramento and Washington. She wants to cut regulations to allow business to grow and deliver more tax revenue. She says veterans deserve to be taken care of. Nelson says it is not an easy fix. He says it is infeasible to have an immediate balanced budget without unacceptable cuts. He proposes spending freezes instead. He opposes the U.S. borrowing money to give money to other nations. He compares it to maxing out credit cards to give gifts to friends. Thorburn says the tax bill is borrowed money funded by bonds and is being given to corporations. He says stimulus spending generates a one-year deficit increase but long term deficit decreases. He notes Clinton was the last budget surplus. He wants to repeal the tax reform bill. Tran says the tax reform bill gave too much to corporations. She says the elderly, the sick, and children are shouldering it. She wants to shift priorities away from war and military spending. She wants to make cuts in the Department of Defense. She wants to shift priorities from the military to seniors and education. Huff says the deficit will be shouldered by the next generation if action is not taken. He believes a balanced budget amendment is necessary. He calls for Congress to not be paid if they do not pass the budget timely, like the Legislature. He notes while Republicans in Congress are being accused of being the problem, he notes it was Democrats in the Legislature. 8:09 PM: Reiff asks for environmental hand raises. Jammal, Thorburn, and Tran feel California needs to do more to promote green energy. Huff, Nelson, and Kim feel environmental regulations are too strict and would also support nuclear energy. Kim says she represented the district for two decades first with Royce and then in the Assembly. She promises to listen to all concerns and represent her district. She wants to give back to the country. Nelson says Royce’s retirement was a surprise for Republicans. He had to make a rapid decision to run. He did not want a coronation. He worked with all sides to make improvements for Fullerton in 8.5 years on the City Council. He says he has done the same at the County and will do so at the federal level. He calls for nonpartisanship, noting his friendship with Congressman Lou Correa. Thorburn says he has been both labor and business. He wants inclusion, high ethics, and democracy, which he says the administration is attacking. He wants everyone to have a chance and opportunity. Tran speaks of her two daughters. She says she is running for families needing health care and women facing sexual violence. She wants to improve ACA and emphasize education. She says she has never run from challenges. She wants to fight for the America she knows and loves for her children. Huff says local government is nonpartisan, where he served for nine years. He found partisan state government could also work by searching for solutions without poking people in the eye. He plugs his web site. Jammal grew up in the district, which had good roads and affordable college. He blasts the tax bill. He calls for new leadership. He calls for health reform. He plugs his website. 8:18 PM: Reiff adjourns the debate.